Mark your calendars. 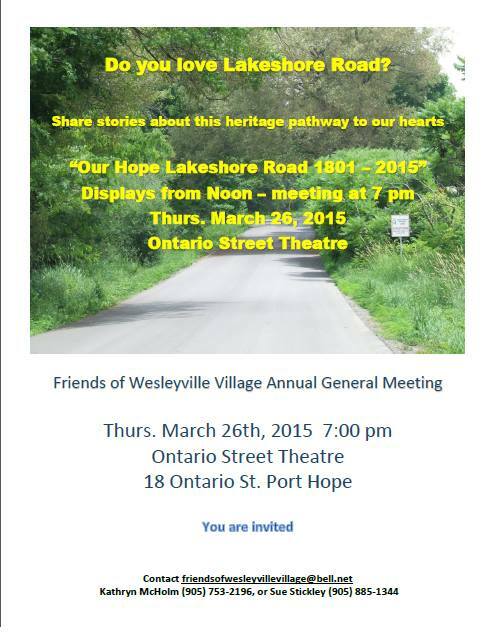 March 26, 2015 noon to 7pm with Annual Meeting to follow.! Once a bustling hamlet, Wesleyville, which lies within the Municipality of Port Hope, Ontario is today often regarded as a ghost town. In the 1970’s, an oil-fired generating station was planned, but the rising price of oil killed the scheme. The site, which had been acquired for the station, was left to deteriorate. With some of the remaining structures demolished, and amidst rumours of an impending nuclear power plant, Hope Township LACAC (Local Architectural Conservancy Advisory Committee) supported by Ontario Power Generation (OPG) and the Port Hope Branch of the Architectural Conservancy of Ontario (ACO), undertook a study to determine the heritage value of what remained of the village: its church, a schoolhouse, two architecturally significant houses, and two barns. 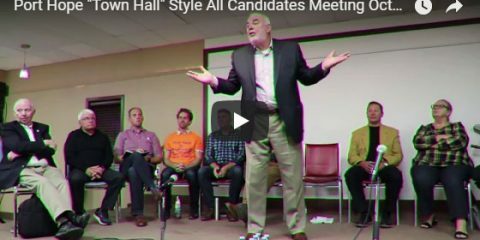 It concluded that Wesleyville. . . is not a disjointed collection of abandoned buildings and overgrown vegetation but layered with archeological, built and natural significance. . . . As a cultural landscape, its core heritage character is as a sanctuary of historic structures and cultural aspirations, amidst a regenerating natural landscape.vegetation but layered with archeological, built and natural significance. To support revitalization of this abandoned community, six heritage advocates formed the Friends of Wesleyville Village in 2008. The Friends, now a charitable organization with 150 members, began its work with the rapidly decaying church, which was owned by the United Church of Canada, represented by nearby Welcome United Church. Although Wesleyville Church had been designated in the 1990s, its condition rendered demolition its most likely fate. Welcome United Church was not willing to sell the building, but was prepared to consider other alternatives. Lengthy discussions resulted in a 20-year lease including explicit goals for the first five years. This precedent-setting arrangement, written up in The United Church Observer, has led other communities to approach the Friends of Wesleyville for advice. As volunteers worked to restore the Wesleyville church, they spoke of feeling A.K. Sulthorpe’s presence. Wesleyville’s church is now largely restored, thanks to the Friends, and the community, which has been highly supportive. Efforts continue to work with OPG-owner of the rest of the village so that the rest of Wesleyville can be preserved and revitalized. For their innovative approach to working with Wesleyville’s owners, and their success in rallying the community, the ACO presented the Friends of Wesleyville Village with the A. K. Sculthorpe Award for Advocacy in 2012. 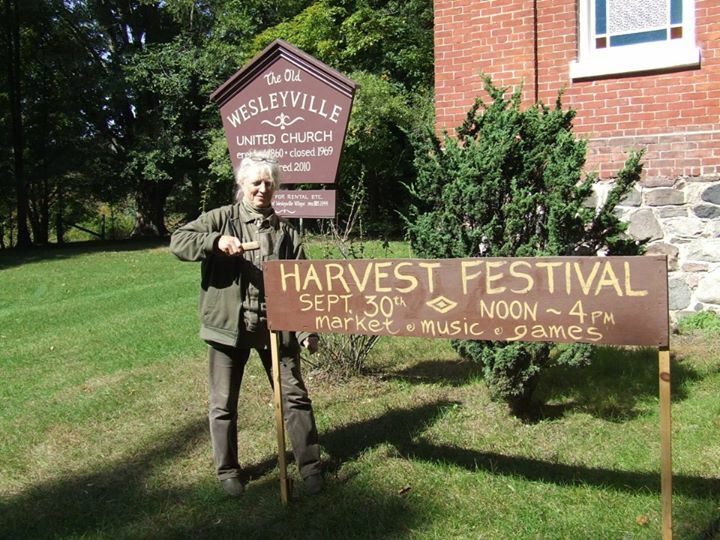 The Friends of Wesleyville Village hold a number of popular cultural and fundraising events each year at the Wesleyville Church and its grounds.